For review of all books under this series: Go here. Recommendation: If you believe in legends, fate, spells, magic and witches; then a perfect book to pick up and enjoy the ride. A powerful story of three women tied by a common legend that wants you to read them completely without keeping them down. Legend has it that the Three Sisters Island was created by the magic of three witch sisters (representing the three elements - Fire, Earth and Air) in the 17th century to keep their people and themselves safe from the Evil behind the madness of Salem Witch Trials. But soon after the three sisters made decisions that caused ripples in the future time. And 300 years later three women - descendents of the original three sisters - would come together on the island again to right the wrong done by their ancestors and kill the Evil forever. 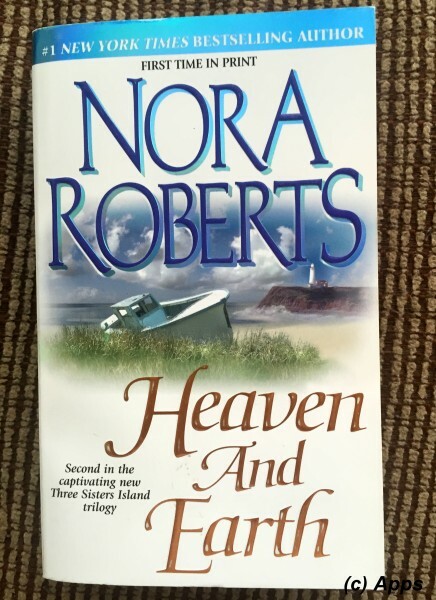 Heaven and Earth is the second book in the Three Sisters Trilogy by Nora Roberts published in 2001. This story revolves around the second sister Ripley Todd (Element - Earth) - Deputy Sheriff on the island - and Dr. Dr. MacAllister Booke - a paranormal researcher. The plot continues after Nell, Ripley and Mia successfully purge Nell of the threat from her ex-husband Evan Remington along with whatever evil was possessing him for the moment. Nell and Zach are married and settled in Zach's home along with Ripley. Just as the world seems to be going smoothly for Ripley, in walks Dr. MacAllister Booke, who has come to the island to research on the paranormal activity and events surrounding Evan's cruelty towards Nell, being pushed to madness by the evil possessing him and the purging by the three sisters. Ripley is a strong woman, a competent officer of law and very well self-sufficient when it comes to being a human and herself. However, she is reluctant to talk or do anything about the fact that she was a witch herself. Mac has those very plans of getting her to open up, accept her abilities and reach out to her full potential of what she is. In the process he was determined to learn the reasons behind her reluctance and refusal to accept her destiny eventually make her his destiny. A reporter also comes to the island to research further on the miraculous escape by Nell from her ex-husband, the way she faked her death and survived. But the strings of the reporter are being pulled by someone else that he cannot control either. The murkiness of the evil inside him puts Ripley on guard and so does the love that she starts to feel for Mac. What follows is how Ripley overcomes her inhibitions, her acceptance of who she is, her acceptance of her love towards Mac, strengthening her bond with her sisters and eventually stand against the evil in the form of the reporter. Another excellent tale by Nora continuing the thread from book 1 to this book. Created enough intrigue in me to finish this book and craving to pick up the next immediately. However I did feel that the book was lengthier than needed. A few episodes perhaps could have been eliminated. Also I wanted to hear the reasons behind Ripley not accepting her destiny earlier than it was projected in the book. Could have helped me understand her better and like her more from the start rather than towards the end. Mac was created perfectly to complement her. I loved the character Mac more than Ripley in the book. Perhaps I connected to him sooner. Otherwise it is a definite pick to continue the series.